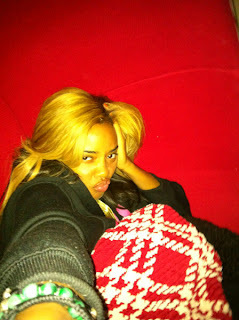 KayKiSpeaks.com: Angela Simmons Goes Blonde??? Feeling This?? If this is the Angela Simmons look you know and love prepare yourself for a bit of a change. The youngest of the Simmons daughters said she made a drastic change and drastic it is. Now, Im not gonna jump and say I hate it or anything, because I dont. I do prefer her hair black,but thats coming from a woman in her mid twenties who has never died her hair! lol.. I just like black hair I think. I dont think it looks too bad tho.. Read on too see the blonde bombshell Angie!